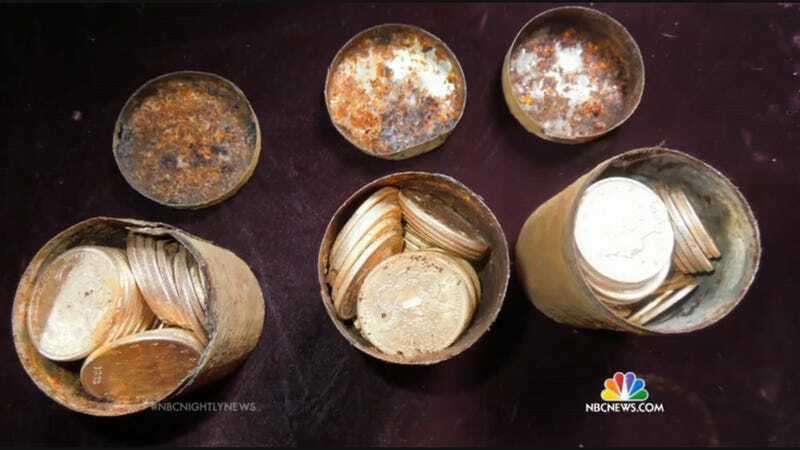 A couple in Northern California recently uncovered a time capsule hunter's dream: six metal canisters filled with rare coins, valued at about $10 million. The canisters were filled with a total of 1,427 coins, all dating from 1847 to 1894. The face-value of the coins only adds up to about $27,000. But the fact that so many are rare and in such pristine condition leads some people to estimate that they could be worth about $10 million. The time capsules were all found on the couple's property in the Gold Country region of California while they were out walking their dog. Apparently the couple spotted a small bit of metal sticking out of the ground and started to dig. They (quite understandably) wish to remain anonymous. "I don't like to say once-in-a-lifetime for anything, but you don't get an opportunity to handle this kind of material, a treasure like this, ever," a representative of the finders told the Associated Press. "It's like they found the pot of gold at the end of the rainbow."